THE FIRST TIME I EVER WITNESSED FIRSTHAND A RACING SLED DOG TEAM COME IN OFF THE TRAIL...was around 11PM on the night I got to Eagle. It wasn't one of my volunteer shifts yet, but I stayed up at the checkpoint to see the leading teams come in. First was three-time Quest champion, Allen Moore, and his canine teammates from SPKennel. I was so very excited to finally get to see these dog teams - some of the best in the world at what they do - actually come in off the trail in person! I'VE BEEN FOLLOWING THIS SPORT FOR YEARS...and by this time I had seen literally hundreds of short video clips of dog teams arriving at checkpoints in the Iditarod, Quest and other races. But I still was not really prepared for what I experienced at the Eagle checkpoint, and I am still in awe. Before I go into that, however, here's a little background. BEFORE THE RACE EVEN STARTS...race rules require that every dog (around 500 of them!) be thoroughly examined from nose to tail by Quest-approved veterinarians to ensure they are fit for the challenges ahead. Once out on the trail, there were 14 veterinarians and 4 vet techs, broken up into teams of their own, that met the dog teams at every checkpoint (plus five additional vet stations) along the trail. RACE RULES REQUIRE MANDATORY VET CHECKS...for every dog at certain checkpoints, so that by the end of the race every dog was thoroughly examined (including taking urine samples!) at least six times. And just like in human sports, performance-enhancing and pain-masking substances are banned. I don't believe there are any human doctors that follow along the trail from checkpoint to checkpoint, but there are a LOT of veterinarians! AS SOON AS DOG TEAMS ARRIVE AT THE CHECKPOINT...the mushers get to work tending their dogs and the veterinary teams get to work as well, listening to hearts and lungs, checking wrists and shoulders for soreness, checking pads for abrasions or splits, checking body condition and hydration, and checking with the mushers to learn of any concerns. (Vets also take urine samples later in the dogs' stay.) And it happened this way from the first dog team to arrive at the checkpoint to the last one to leave. Estimates are that each veterinarian will spend over 200 hours during the course of the race examining and caring for the dogs. The vet teams end up almost as sleep-deprived as the mushers! THE VET TEAMS TRAVEL EQUIPPED TO HANDLE EVEN EXTREME EMERGENCIES...and are fully prepared to run IV's, administer drugs, and even do surgeries if needed. Each musher has a "vet book" for their team that has veterinarians' notes for each dog. The vet team makes notes in the book for each dog after every examination, and the vet book must be signed by the veterinarians and presented by the musher at each successive checkpoint. This ensures that all pertinent medical information passes "down the trail" for consistent oversight of the entire dog team's health and performance. Veterinarians also talk by phone to their peers at other checkpoints up and down the trail to discuss any concerns they might have. SO AFTER WATCHING THIS PROCESS OF CARE PLAY OUT AS TEAM AFTER TEAM CAME AND WENT...what struck me most was the bond. The deep, mutual and obvious bond of trust, not just between each musher and their team as a whole, but between each musher and each of their individual dogs. Bonds like that only develop through long hours of companionship and care, long hours spent traveling the trails and weathering the storms together. Long hours - and miles - of taking care of each other. THESE MUSHERS KNOW AND CARE FOR THEIR DOGS...in ways (to be frank) that far exceed what the vast majority of pet owners ever experience. And the veterinarians came right alongside the mushers as partners in support of that bond of mutual care and trust, as partners in the endeavor to provide the best care possible for these amazing athletes. They didn't just take care of these dogs, they loved - and loved on - these dogs. I never quite expected that. And I am still in awe of it. "Dog Team on the Hill"
Now that the season is over and we are in our slack period we are catching up on chores around the homestead and working on the web site. Over the past few years we have seen an upswing of false information out there on the care of these wonderful animals. Certain groups are just determined that any dog that is a working sled dog is being abused. People see their articles and believe their lies and half truths. If anyone want to find out for themselves all they have to do is check out a dog kennel, see how the animals are loved and cared for. Over the next few days I will be posting an excerpt of some articles that one of our clients did this past winter. She came for a 2nd tour with us and started it off by helping out at the Yukon Quest Eagle Checkpoint. What she writes is eye opening. Hopefully you will enjoy it as we have. Thank you… Michelle Keil! "DOG TEAM ON THE HILL!!!" EXCITEMENT IS HIGH WHENEVER THE CALL GOES UP, "DOG TEAM!!! 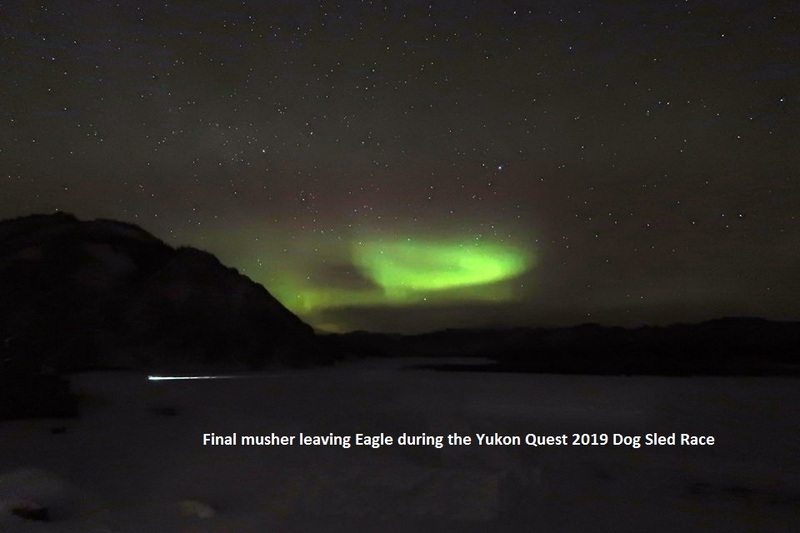 "...to signal the arrival of the next Yukon Quest team coming down the hill into the checkpoint in Eagle. Watching teams come off the trail - the previous checkpoint now 150 miles behind them - with faces smiling and tails wagging never gets old. IMMEDIATELY UPON EACH TEAM'S ARRIVAL A "CHECKER" DOCUMENTS REQUIRED INFORMATION... musher's name, bib number, exact time of arrival and how many dogs the musher has with them. (They must check in with the same number of dogs that they left with at the last checkpoint.) Checkers also confirm that the musher has all of their mandatory gear, such as cold weather sleeping bag, hand ax, snowshoes, veterinary record book, dog booties, cooker to melt snow and heat dog meals, their SPOT GPS tracker, etc. CHECKERS ARE VERY EFFICIENT...the whole check-in process usually taking less than three minutes. Teams are then immediately "parked" in a spot in the "dog yard" where other volunteers/checkers bring the musher's Drop Bags and bales of straw to them. As soon as the sled comes to a stop in the dog yard - and before doing anything else - the musher begins to care for the dogs, laying out straw for bedding, removing dog booties, checking paws for any signs of damage and joints for any soreness, and getting water to make the dogs' meals. WORKING IN TEAMS, VETERINARIANS BEGIN AT ONCE...to check each and every dog, listening to their heart and lungs, checking their pulse, checking paws and joints, and assessing their overall condition. Mushers can also request specific veterinary assistance at any time during their 4-hour mandatory stay at this checkpoint if they have any dog(s) they want the veterinarians to check for any specific problem. (More on dog/veterinary care in another post.) Once the dogs are bedded down, have eaten and are resting comfortably, then and only then will mushers come inside to eat, warm up and maybe catch a short nap. I TIMED SOME OF THE MUSHERS FROM THEIR MOMENT OF ARRIVAL...to see how long it took them to get straw on the ground for their dogs and to begin taking off booties. With all the ones I clocked, it took them only 5 to 6 minutes from arrival to having bedding on the ground for the dogs, and that includes their check-in! But it was generally 60-90 minutes after their arrival before the musher came inside to eat, warm up and take care of their own needs. Dogs always came first. And dogs who are veterans of this race are pros...as soon as straw arrives they get right down to the business of making themselves comfortable and resting while the musher tends to their other needs. They know how to bank rest so they'll be ready to roll when the musher again pulls the hook to head on down the trail. LEAVING THE CHECKPOINT, THINGS HAPPEN PRETTY MUCH IN REVERSE. Mushers wake from their short naps (usually only an hour or two), maybe eat a little something, then go outside to care for their dogs again and pack supplies needed for the trail ahead. Some made another meal for their dogs or gave meat snacks. Many would get their dogs up and walking around a bit to limber up, and some gave massages. All dogs would get paw ointments and fresh booties put on, along with any cold weather gear (jackets, ruffs, etc.) they might need for the cold, windy run down the Yukon River. STAY TUNED FOR MORE ON DOG AND VETERINARY CARE!!! Our winter season has come to a close and the dogs are enjoying the free play time and laying around in the sunshine. We have now entered our getting ready for winter phase. Spring is usually a muddy but fast transition to our short summer and an even shorter fall. We are fully into the mud season as our floors here at the homestead can attest. They stay covered with wet, muddy paw prints. Bear with us as we work on this new website! Check back for posts to our blog as I figure out how to do it! !